The power in Neurolingo's Mnemosyne™ text analytics platform comes from a highly modularized and easily maintained set of XML-based processing rules and analysis modules that break information in content sources down into their most basic language componetnts to place words and data in their proper semantic context. 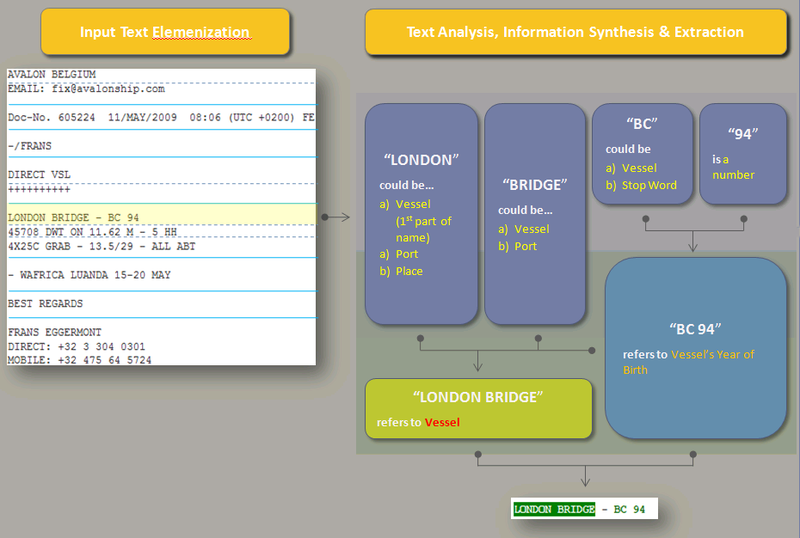 This allows the content extraction and language analysis rules of Mnemosyne to be adapted rapidly to any type of information presented to them, including unstructured and specially coded documents, to identify patterns that fit the logic and vocabulary of any topic domain, language, culture or industry. The Mnemosyne text analytics platform can easily assemble complex maps of language rules that can be processed in parallel and scaled readily for large-scale sources and real-time information feeds. This enables Mnemosyne to process large amounts of information rapidly on any information processing platform and to deliver valuable data, reports, documents and summaries in any application format. Mnemosyne is a Java-based development platform that is adapted easily to any computer processing environment. Read our white paper and learn more. Language resources identify and break down text into its elemental components. 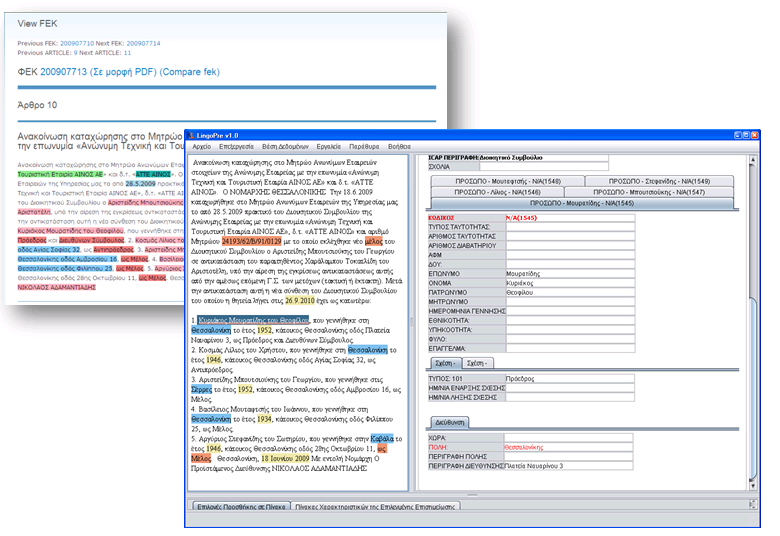 Language resources in Mnemosyne include a Morphological Lexicon, which identifies graphemes, orthography (letter sequencing), morphemes, morpheme-syntax relationships, style, topic domain attributes and more,combining to create a resource of many thousands of lexical units and millions of wordforms. "Kanon" rules define the grammar of a given language or domain. 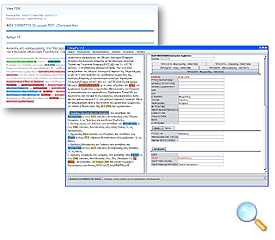 Mnemosyne uses the Kanon semantic annotation rule language for the definition of syntax and grammar rules to extract information from textual sources. The rules are defined and maintained by an easy-to-use screen-based software interface. 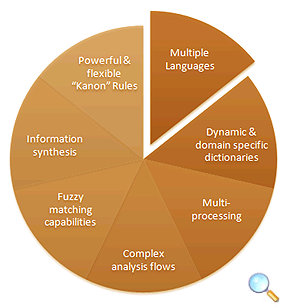 Because the Kanon is not tied specifically to the rules of any particular spoken or written language, Kanon rules can be adapted readily to any number of types of informaiton sources, including the interpretation of forms, domain-specific terminology and jargon. 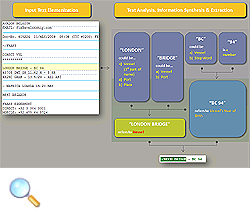 Analysis modules extract higher levels of meaning from information packaged and structured by Kanon rules to create specific types out outputs such as data displays, reports, information extracts, indexes and references. The output of each analyzer can be filtered before it is used as input to another analyzer to simplfy and accelerate applications development. Analysis modiles incorporate adjustable text matching precision based on both semantic rules and statistical rules to ensure high accuracy in pattern and word extraction. Specialized analyzers ensure the transfer of extracted information to specific destinations and formats (e.g. XML, Database tables, etc.) and enable procsess monitoring and audting. Using Mnemosyne software tools you can easily add, update and delete semantic rules and annotations created by its automated processes to maximize the quality and accuracy of the extracted information. With Mnemosyne it's simple to change both processing rules and output formats, making it easy to respond to both changes in text and language patterns and requests for enhancing data formatting in applications based on the attributes of extracted information, aggregated results, comparisons to other information sources or other processing rules. The result is a powerful, flexible and easily maintained semantic applications development tool, ready to meet your needs for software and services development. Through the process of developing its Mnemosyne text analytics development platform, Neurolingo has published a range of software tools and print publications that help people to understand languages and to correct language use in documents. You can use these tools as they exist or use Mnemosyne to develop your own language tools for specialized applications and publications. Spelling, Thesaurus and Hyphenation proofing tools for the latest versions of the Microsoft Office™ office productivity suite. Our Lexicon online spelling tool generates information about the structure of words and related words and terms. Try it! Spelling, Thesaurus and Hyphenation proofing tools for open office productivity suites such as OpenOffice StarOffice and NewOffice. Generate dictionaries and thesauri for books and online publishing, for any spoken language, dialect or specialized industrial terms. Neurolingo proofing tools are functional components of all contemporary versions of Microsoft Office word processors. They help their users (typists, typesetters, writers, translators, editors, etc.) to carry out automatically a set of text processing operations, such as hyphenation, spelling correction, grammar and style correction, summarization, translation, etc. Neurolingo has developed the following proofing tools for the treatment of Modern Greek: Hyphenator: indicates the hyphenation points of a word so as to help typesetting systems to correctly hyphenate words near the paragraph border. Speller: flags words with spelling errors and suggests orthographically correct alternatives. Thesaurus: suggests synonyms and antonyms for more than 22.000 Greek words (independently of their inflections). The Speller, the Hyphenator and the Thesaurus for MS Office 2000/XP/2003 (Windows) and Χ/2004 (Mac OS X) are bundled together in one CD-ROM. Suggested retail price (incl. VAT): 30€. Requires serial number registration. Try the speller tool online. MS Office 2000/2002(XP)/2003 for Windows and Χ/2004 for Macintosh. OpenOffice 1.1-1.5 & 2.0-2.0.2 for Windows, Linux, Solaris x86 and Solaris Sparc. StarOffice 7 & 8 for Windows, Linux, Solaris x86 and Solaris Sparc. NeoOffice 1.1-1.5 & 2.0-2.0.3 for Mac OS X.
Mozilla Thunderbird 1.5-2.0 for Windows and Linux. Quark Xpress 4.03 for Windows. Adobe InDesign 2.0/3.0(CS)/CS2 for Windows and Macintosh. Adobe Photoshop 7.0/8.0(CS)/CS2 for Windows and Macintosh. Adobe Illustrator CS/CS2 for Windows and Macintosh. Neurolingo's Speller for Modern Greek uses a main dictionary and several secondary dictionaries. 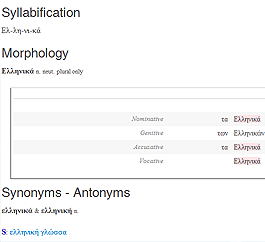 The main dictionary contains common Modern Greek words, coming from Neurolingo's Morphological Lexicon (~1.200.000 wordforms), which is enriched on a daily basis with new words taken from a constantly evolving corpus of newspaper and literature texts as well as from reports of Speller's users. Secondary dictionaries pertain to domain-specific vocabularies (such as a dictionary with ~10.000 Greek place names) or foreign language vocabularies (such as an English dictionary with 200.000 wordforms). The foreign language dictionaries are used for the treatment of multilingual texts (e.g. Greek-English) in text processing environments that lack language detection (e.g. MS Outlook/Excel/Access, Mozilla Thunderbird, etc. ); that is, apart from Greek text, Neurolingo's speller is able to process English (and soon French) text. The engine that searches for spelling alternatives is 10x faster than the corresponding engine of the English speller of MS Office. Neurolingo proofing tools are available for all contemporary versions of the OpenOffice, NeoOffice and StarOffice word processors. They help their users (typists, typesetters, writers, translators, editors, etc.) to carry out automatically a set of text processing operations, such as hyphenation, spelling correction, grammar and style correction, summarization, translation, etc. Neurolingo has developed the following proofing tools for the treatment of Modern Greek: Hyphenator: indicates the hyphenation points of a word so as to help typesetting systems to correctly hyphenate words near the paragraph border. Speller: flags words with spelling errors and suggests orthographically correct alternatives. Thesaurus: suggests synonyms and antonyms for more than 22.000 Greek words (independently of their inflections). 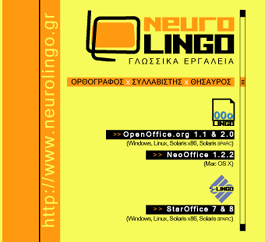 The Speller, the Hyphenator and the Thesaurus for OpenOffice.org , StarOffice 7 & 8 and NeoOffice are bundled together in one CD-ROM . Suggested retail price (incl. VAT): 30€. Requires serial number registration. Our Thesaurus software is a special purpose lexicon that aims to express the meaning of Modern Greek words or phrases through synonyms, antonyms and example uses. It is the result of more than four years systematic work. Its development was entirely computer-based (see Thesaurus Editor); its lemmata were organized and stored in a lexicographical database, thus enabling tests and cross-checks that verified the correctness of the information content and the consistency of the inter-lemma references. Browse the online version of Thesaurus. 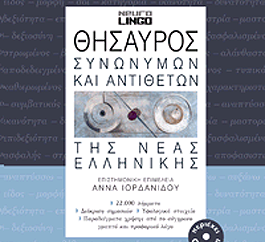 Thesaurus of Modern Greek (see sample pages), developed under the supervision of Associate Professor of Linguistics Anna Iordanidou, was published by Patakis Publications in August 2005. With more than 22.000 lemmata, it is an innovative and handy dictionary that aims to help its user find the appropriate words in context or specify the meaning(s) of a word through its synonyms or antonyms (see detailed description). Read about Thesaurus in Kathimerini of Sunday (May 7, 2006). 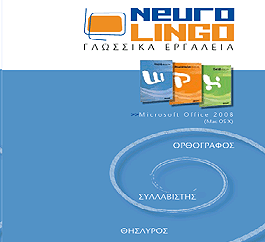 Thesaurus is distributed by Patakis Publications. Suggested retail price (incl. VAT): 19€. You can buy Thesaurus on-line from the following electronic book stores: Patakis, Eleftheroudakis, Papasotiriou, Kondyli and BookStore.gr. Our Greek dictionary «ΧΤΙΖΩ ΛΕΞΕΙΣ» (Building Words) presents the ways in which the Modern Greek words are "built", what their constituents are and how they combine. It includes meanings, word constituents, word lists, examples, synonyms-antonyms, and comments on spelling and etymology. A complete index of the 6,850 words in its word lists is given at the end of the dictionary. The dictionary is an aid for students or anyone who wants to learn about word formations in Modern Greek. The dictionary was developed through electronic processing and specialised lexicographical tools by Neurolingo. The dictionary is distributed by Kondyli Publications. Suggested retail price (incl. VAT): 14€.